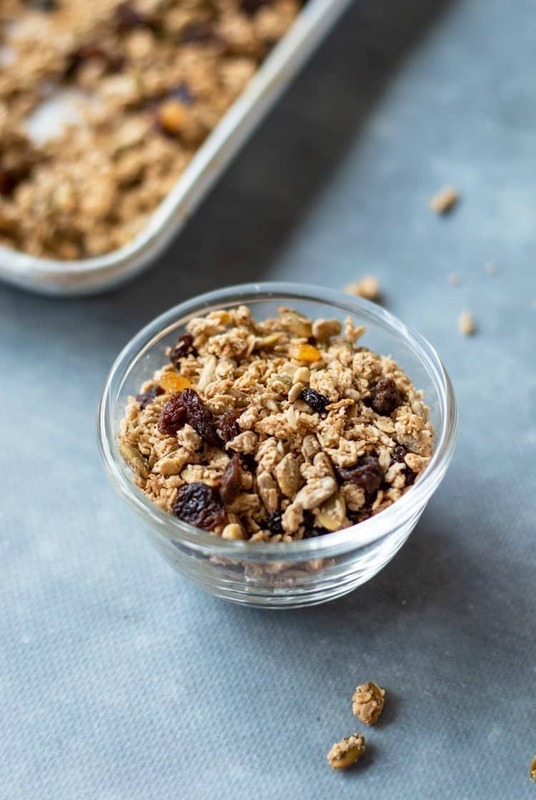 A delicious recipe for homemade crunchy Thermomix Granola that’s so simple to make. Just mix everything together in the Thermomix, then toast for half an hour and it’s ready to be enjoyed or stored for later. There are hundreds of granola recipes out there but this one is really simple. Made with just oats, pumpkin and sunflower seeds, raisins, maple syrup for sweetness, cinnamon for spice and some coconut oil to give it a lovely crunch. You could always add some nuts for extra goodness or some orange rind and juice, the possibilities are endless. The cereal aisle in the supermarket is flooded with granola boxes, which are usually over laden with added sugar and very expensive. 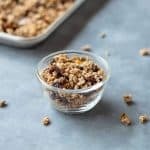 This recipe does have maple syrup but according to some it does have a few health benefits over the refined stuff. I love it served with just almond milk, or jazzed up with yogurt and fresh berries. Once made, the granola can be stored in an airtight container in the pantry for a few weeks. 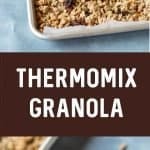 Simple and easy to make, this Thermomix Granola can be served with just milk or jazz it up with yogurt and berries for the ultimate breakfast. Preheat the oven to 150ºc and line a large baking tray with baking paper. Add the maple syrup, melted coconut oil, vanilla essence and cinnamon to the TM bowl and mix for 3 sec/speed 5. Add the oats, pumpkin and sunflower seeds, and mix 20 sec/reverse/speed 3. Spread the mixture evening on the baking tray and bake for 30 minutes, stirring halfway through. Once cooked, mix in the raisins and leave on the baking tray to cool completely. 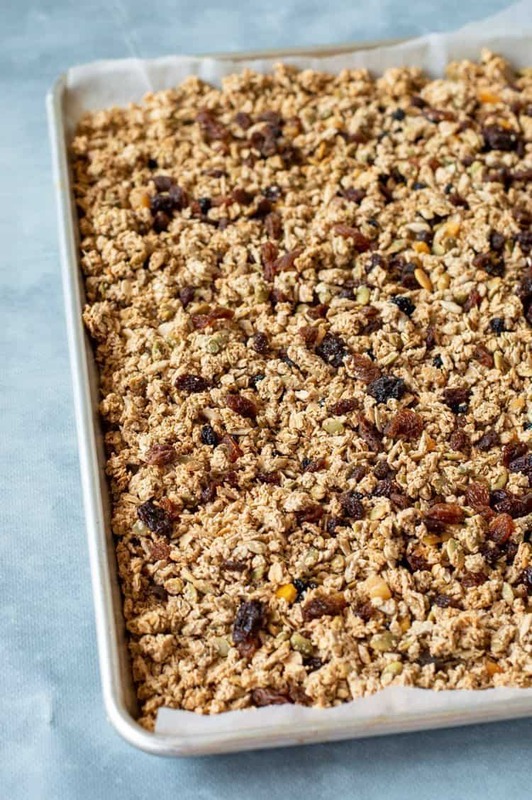 Once cooled, the granola can be stored in an airtight container in the pantry for a few weeks. Follow me on Facebook for all the latest recipes. Can I use olive oil or grape seed oil? Grape seed oil has a very mild flavour so should be ok to use in the granola without affecting the taste. I probably wouldn’t use olive oil as it’s quite strong and the flavour could come through in the granola. Hello and welcome to my blog! I’m Vicki and here you will find lots of FREE Thermomix recipes for every occasion.